You can use AFerry to book a Manche Iles Express ferry to the Channel Islands, France and England. Manche Iles Express provides these services using two high speed catarmarans. You can use AFerry to book Manche Iles Express Ferries to Granville, Diélette and Barneville-Carteret in Normandy with the Channel Islands of Jersey, Guernsey, Alderney and Sark. See below for the latest Manche Iles Express Ferries prices and sailing times. Click on your ferry route for a detailed Manche Iles Express Ferries timetable. 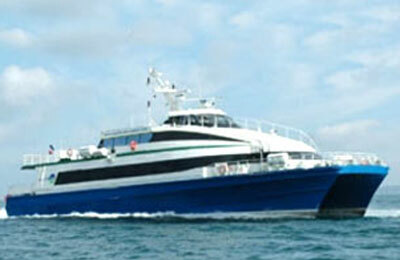 Manche Iles Express has 2 high speed catamarans, the Marin-Marie and Victor Hugo. Onboard you will find a number of facilities, including a bar and airline-style seating. Please note that all services with Manche Iles Express are for foot passengers only. Whichever Manche Iles Express service you choose, you are bound to have a relaxing and pleasant experience. Book your Manche Iles Express ferry with AFerry. How long before departure should I arrive for Manche Iles Express? Passengers must check-in for boarding a minimum of 1 hour prior to departure. Any passenger, including passengers holding tickets, arriving to check-in less than 30 minutes prior to departure, may be refused boarding and will have no recourse against MANCHE ILES EXPRESS. Passengers who are refused boarding because of late arrival for check-in will remain liable for the cost of the fare. Each passenger must have a ticket before boarding. Tickets must be retained by the passenger for the duration of the crossing and for arrival & departure procedures.